The most comprehensive database available of all 48,956 UK cities, towns and villages – with linked counties, countries, postcodes, grid references, latitude-longitude coordinates and more. It is ideal for location lookups, website development and data verification. Get clean, consistent and well-organised data, with no need for lookups or conversions. All 48,956 towns have linked location information (including county, country, region, postcode, local government area, grid reference, easting-northing, latitude-longitude and elevation) and, unlike many other datasets, it fully covers the whole UK including Northern Ireland and suburban areas in Greater London. 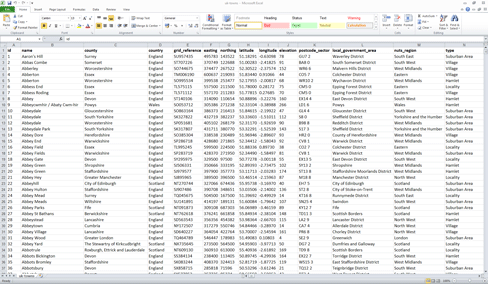 The data is compatible out-of-the-box with nearly all SQL databases, GIS systems, programming languages and spreadsheet applications – including Excel and Open Office. Which means you can get to work quickly and easily with the software of your choice, without worrying about time-consuming file conversions or imports. You can have complete confidence in the quality and accuracy of our data. All records (inlcuding location data) have been updated for 2019 with the last complete refresh was on the 2nd April 2019 . You can download a sample or check the data with the live online search. We only use the latest information from official sources including Ordnance Survey, the Greater London Authority, the Office for National Statistics and NISRA. The data is completely refreshed every quarter and undergoes regression testing and quality assurance checks before each release. Does the database contain all towns? Yes. 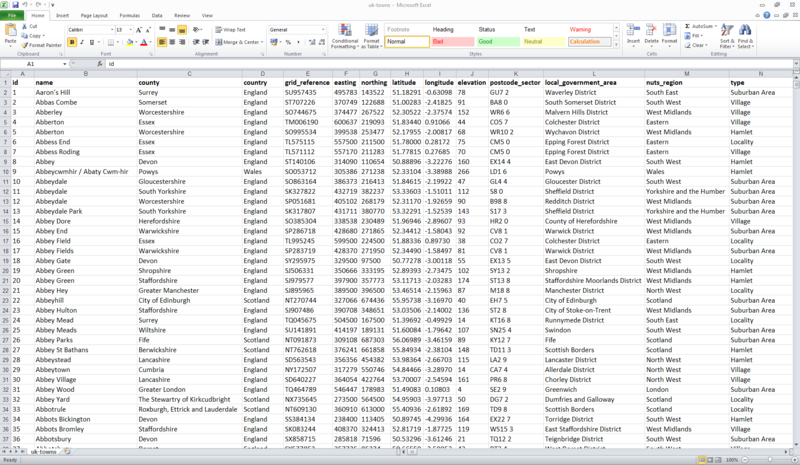 The data contains all 48,956 cities, towns, villages, hamlets and suburban areas in the UK. Historical settlements are not listed. Location information is provided for all settlements – including postcode sector, county, country, elevation, easting-northing and latitude-longitude coordinates. Yes, if you purchase either the ‘Business’ or ‘Enterprise’ packages then quarterly data updates will be automatically emailed to you at the start of January, April, July and October. The last update was made on 2nd April 2019 . This release was a full quarterly refresh of the data, and also introduced a new field for elevation. All four countries of the United Kingdom (England, Scotland, Wales and Northern Ireland) are covered without any exceptions or gaps. For convenience, towns and villages in the Isle of Man are also included. Yes. If our sample data download or online lookup doesn't give you the assurances you need please feel free to contact us for a custom sample extract. Townslist.co.uk specialises in high-quality and developer-friendly location data for the United Kingdom. In operation since 2011, we serve hundreds of organisations throughout the UK and internationally who use our data to power their websites, IT systems and quality assurance processes. © Townslist.co.uk 2011-2019. Contains public sector information licensed under the Open Government Licence v3.0. Request received 2019-04-23 07:11:49 BST from 54.91.121.255 and served by Digital Ocean.